The focused aspect, however, was a great success. Baking bread is actually a pretty easy task, and not even particularly time-consuming in terms of active time. You do, however, need a whole afternoon for it, because the bread will have to rise repeatedly and be left alone for an hour here, 20 minutes there, a half hour here. This, though, could not have been more satisfying, and was also pretty fun. And the end product was absolutely delicious — and as big as the baking pan. I took half of it to a break-fast dinner party, gave a few slices to my roommates, and brought the rest to work the next day. And at every stop, it was greeted joyously. 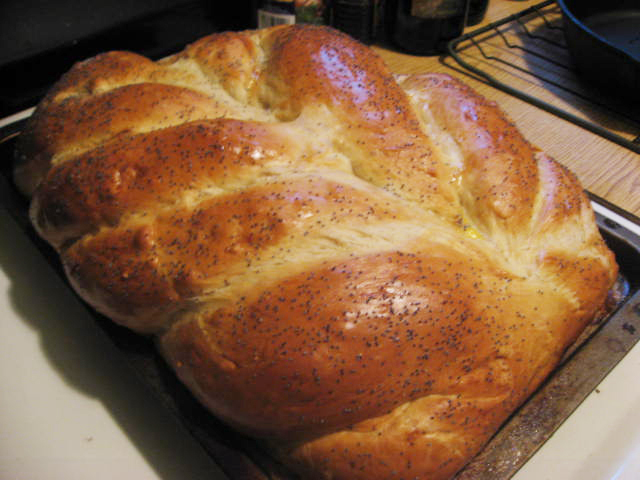 Because bread baked from scratch is a joyous occasion, and one that I think I will be replicating more often, as I embark on the search for a perfect challah recipe. This, however, may already be it, as I can’t really think of a single thing I’d change (except maybe making it smaller in the future!). 1. Place 6 cups of the flour in a large bowl and make a well in the center. 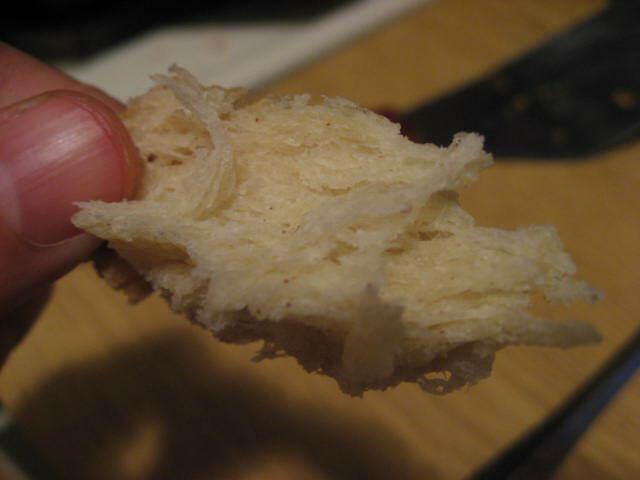 In a small bowl, stir the yeast into 1 cup of lukewarm water until dissolved. Add this to the well. 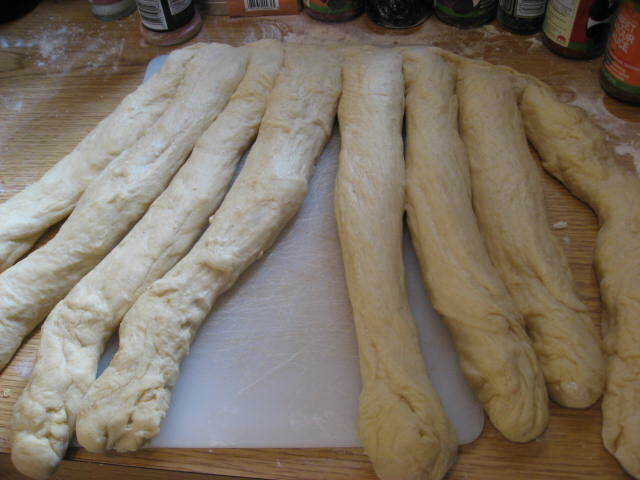 Using a fork, stir around the well, gradually incorporating ¼ of the flour — no more — into the yeast mixture. Set the bowl in a warm place and let stand 45 to 50 minutes. …and this is what it looks like 45 minutes later after it has risen, and started to take over the bowl. 2. Sprinkle the baking powder, cinnamon and salt over the flour mixture. Add the vanilla, 3 of the eggs, the oil (or butter) and 3/4 cup of the sugar. Add 1 1/2 cups lukewarm water and blend again, first using the fork and then your hands. 3. Add 2 cups of flour, kneading for about 10 minutes. If the mixture is still too sticky, add up to 2 cups more of flour (the NYT says up to a cup, but my dough was still too sticky, so I added another cup, with no adverse effects). The dough is ready when it doesn’t stick to your hands. 4. Shape into a rough ball, cover, let stand 20 minutes and then turn it out onto a lightly floured board. Knead well for about 5 minutes, adding a little flour to the board as needed to prevent sticking. 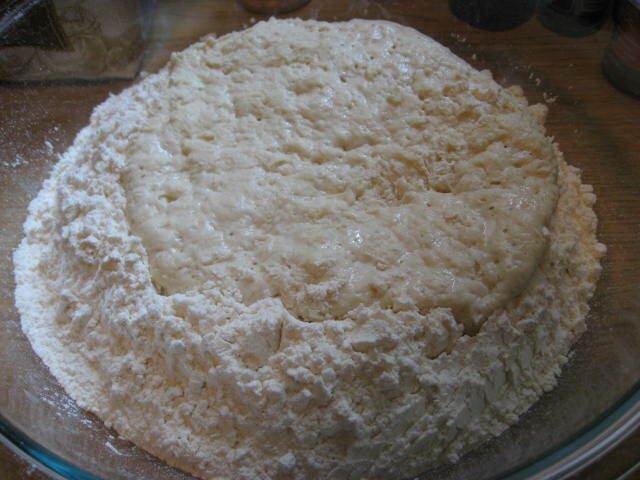 Set the dough in a floured bowl and lightly coat in flour. Cover and let stand for 30 minutes. 5. Turn the dough onto a flat surface and knead briefly. Cut off 1/8 of the dough, knead quickly, shape into a ball, flour lightly and let rest briefly. Repeat with remaining 7 pieces. Using your hands, roll each piece into a 12-to-15-inch-long rope. Continue with remaining balls. I found the rolling a little tricky, because my dough kept wanting to spring back to ball-form; work through it and you’ll get the hang of it, though. 6. Align the ropes vertically, side by side. Gather the tops together, one at a time, pinching down to seal. Separate the ropes down the center, 4 to a side. Braid them as follows: bring the outer right rope over toward the center next to the inside rope on the left. Bring the outer left rope over toward the center next to the inside rope on the right. Repeat this process until the loaf is braided. As the last ropes are brought over, pull and stretch them a bit as needed. When braided, gather the bottom ends of the ropes and pinch them together. The NYT didn’t specify how the whole thing comes together as a loaf, but I guessed (and it seemed right) that I was supposed to kind of push the two braided sides together. They might just bake into each other anyway, so I’m not sure that arranging them is even necessary, but it didn’t hurt in my case. 7. Generously oil (or butter) the bottom and sides of a large baking sheet (you can use a paper towel to spread the oil). 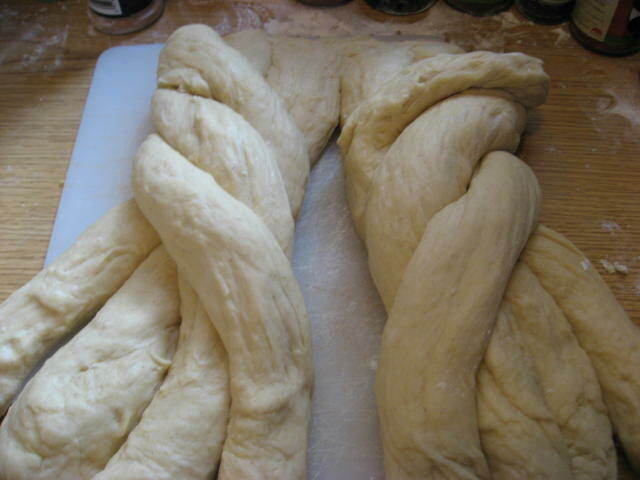 Carefully lift the braided loaf and transfer to the baking sheet. Cover the loaf with a towel and place in a warm spot until the loaf is doubled in size, about 45 minutes. 8. Preheat the oven to 325 degrees F. Beat the remaining egg with the remaining 1/8 teaspoon of sugar. 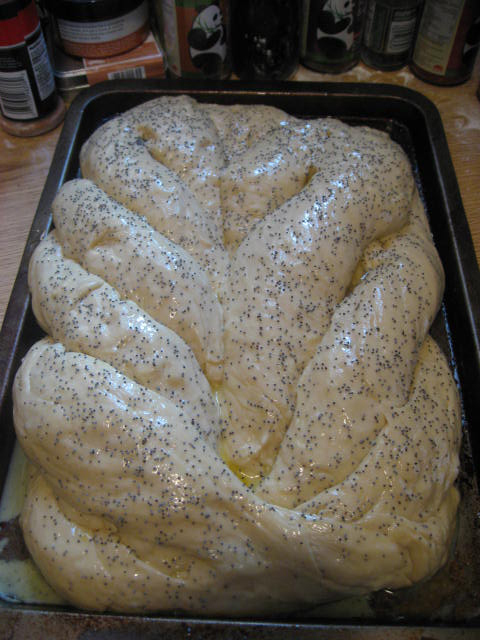 Brush the loaf with the egg wash (I just kind of poured it on and smeared it with my hands, which wasn’t the best strategy; if you don’t have a pastry brush, I’d use a paper towel, gently) and then sprinkle with sesame or poppy seeds. Bake until puffed and golden, about 1 hour. 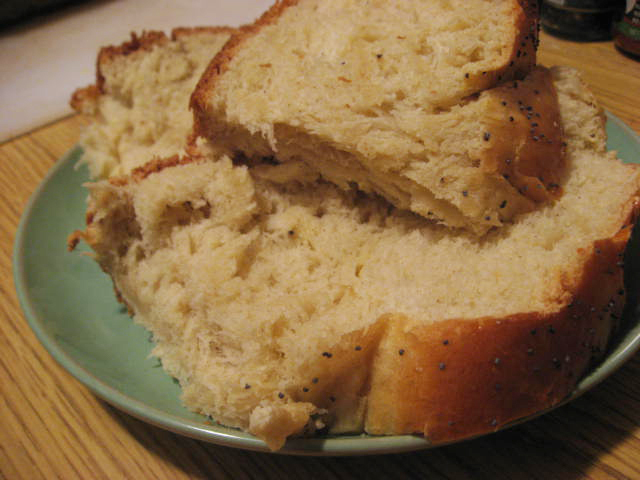 This is the kind of fluffy texture you want in the finished challah — the bread will pull apart.